“That’s the other list,” she told me. Suddenly I was interested. Alas it’s not “Most Popular Shakespeare” but I love that some Shakespeare made it to the top overall list! 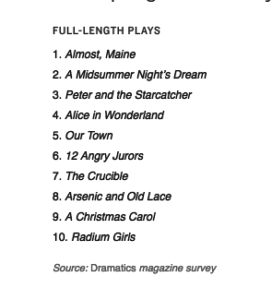 How do you think other Shakespeare plays ranked? Which play would be next on the list and just didn’t make the cut? A tragedy or a comedy? Maybe Comedy of Errors, because it’s easy to produce? Also, I must be out of the loop because I don’t recognize several of these, at all. Almost, Maine? Though if somebody tells me that Radium Girls is about Marie Curie (and women in science in general) then I’ll be very pleased. I am assuming that somewhere along the line 12 Angry Men turned into 12 Angry Jurors so that they could more easily cast female roles? ‹ PreviousSo, Anybody Want To Pre-Read My Book? Radium Girls is about the female factory workers who made watches with glow-in-the-dark (containing radium) paint. They would even put the brushes with the paint in their mouths, having been told it was safe. Then years later, turns out that was really dangerous! Some successfully sued the company. I would say Romeo and Juliet or Much Ado, because of the rampant romance angle and the absence of cross-dressing. There’s a touring company of Lear happening here in Maine beginning in October … I am thrilled, but it seems pretty courageous to program Lear for High School. Good for them!